After declaring a state of emergency in the country, the decree laws of the government have replaced the law and therefore the constitution (already suspended partially) in Turkey. The main aim of the government since the failed coup attempt is quickly avoiding the cases slowing down or hindering the construction of the new structure of the state. So that merging the security apparatuses and connecting them directly to the ruler has been undertaken. What is expected is to maintain the absolute power of the ruling party and to surpass the threats against accumulation of capital without any economic or political lost. These aims were almost achieved in 2017 – especially by the referendum in April 2017. That is to say, the referendum in 2010, that annihilated the division of powers, has been sustained and advanced further by the decree laws since July 2016 to the present and the referendum in 2017. Five major themes have emerged as critical issues in the consolidation of the new structure. 1. The government, ever since the beginning of its rule, has begun to try seizing all public organizations or establishing alternative ones when it has not been strong enough to seize. This effort has now entered a new phase. Article 108 of the constitution has been amended after the referendum in April 2017. This amendment has authorized the state auditing board of the presidency (DDK) to undertake “administrative investigations” for all public agencies and institutions and professional organizations that have the status of public agency or institution. As a result of that authorization, the government has announced that the possible independent structure of organizations except the state is not recognized any longer. That is to say, from now on all independent public organizations are under threat. 2. There has always been a tension between the police and the army in Turkey. Most of the underlying reasons have already been eliminated in favour of the government. Definitely, the main reasons were accepted as the relatively autonomous administration and resource management of the army in comparison to the other. In addition to this, the army had been accepted as the protector of the Kemalist ideology. As is mentioned, most of the reasons have already been eliminated, and the remaining ones have been eliminated by the authorization given to the police department to use the vehicles, arms and properties of the military police department in need without any special permission by Article 12 of the decree law numbered 668.1 Therefore, the police department, always known as loyal to the ruler, has gained more power against the relatively less loyal structures in the past. 3. Within the old structure of the state, every security apparatus had its own intelligence section. The reason was the different needs and the different uses of the information. Beside this, because of the legal and administrative obstacles, investigating individuals and organizations was not easy “enough” to perform for the intelligence services. These all have been changed by Article 62 of the decree law numbered 694. First of all, the national intelligence coordination council (MIKK) was established under the administration of the president. The main tasks of the MIKK have been defined as merging and managing all the intelligence services both inside and outside of Turkey, providing the coordination between the offices, the public agencies and institutions and also monitoring their tasks and responsibilities, and announcing security forces about them if it is needed. What is more, the MIKK has the authority to perform security clearance for any person, agency or institution. This means everyone and every organization might be monitored – with or without any legitimate reasons. 4. There are many active pro-government paramilitary groups in Turkey. After the declaration of state of emergency, many of them began searching for a way to legalize themselves. Despite their unrecognized status among the state institutions, the groups had the direct support of whom they were working for. Moreover, each was benefiting from many official opportunities. They were more like official organizations rather than civil ones. However the groups were still feeling themselves uncomfortable because of the unofficial recognition of their position in the state. Then the state, under the decree law published with the number 696 on 24th of December 2017, has finally recognized the official status of the paramilitary organizations that were already responsible for many dirty jobs such as using violence against the peaceful opposition. 5. The government has undertaken the revision of the election system in February 2018 by the amendment of many articles in the constitution. Many groups in the opposition describe the revision as the annihilation of the elections due to legitimating some of the anomalies in a possible fair election. One of them is the repeal of the article that the voting envelopes and papers have to be signed and approved officially. The opposition claims that this amendment makes possible to use fake voting envelopes and papers in the upcoming elections. In addition to that amendment, security forces have gained the right to remove everyone in the polling stations if it is needed. It is well known that security forces are mostly supporting the government. Who could claim the privacy of the voting polls any longer by this amendment? Another amendment is the repeal of the article that makes compulsory for an individual to use voting IDs with the other individuals living in the same location and therefore being on the same voting list. The consistency between the locations and the voting lists was accepted as a measure to prevent giving vote by fake identities. But now the Article is no longer available. However that is not all. Furthermore, the assignment of the chairman of the board of polling stations has been taken over by the government. It is an amendment clearly against the neutrality principle of the chairman. People from other countries are usually curious about how an anti-intellectual political organization could be so influential on the masses. There are many reasons for this. But one of the main reasons is the bourgeois press. The bourgeois represented in the government owns 90 per cent of all the press in Turkey including TV and radio channels, newspapers, journals, etc. It means when someone relates with a media organ, she or he sees, listens and reads only the same source. 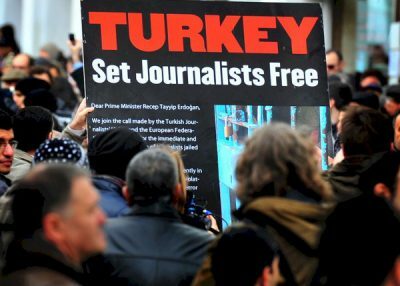 As for Turkey, it might be seen that the press is an important instrument of the existing order to persuade the masses for a country without law. The law in Turkey is actually the sum of decisions given by the ruler and his officials. At exactly this point, the need for legitimacy of their decisions is conveniently supplied by the bourgeois press. This could only be done by the press itself. It gathers all individuals together into a common place. Using this opportunity, it gains the chance to persuade or threaten the subjects in favour of the government. And it does not hesitate to use different kinds of manipulation and disinformation for this mission. The press has always been influentially used during the AKP rule. Many visual and printed media organs have established without caring about their ratings. Here the only measure has usually been making the party ideology, Political Islam more apparent and more effective. What is important is the concrete consequences of the influence performed by the press. And these consequences have been the direct products of the Political Islamist intelligentsia not having any academic or intellectual formations but having fake or fictional titles. These “experts” aim to determine and control the minds of people by the media organs. Various subjects from daily problems to social events are being undertaken by the “experts” at the media organs. By focusing the minds, Political Islamists have two main ends. One is politicization; and the other is depoliticization of the masses. For the goal of politicization, the first thing is to polarize and divide the masses for the negative cases in charge of the government. Then passing the buck to the opposition, even if it is the victim. By this process, it is as easy as pie to mark workers, peasants, students, academicians, intellectuals, journalists, engineers, lawyers and many others who protest the violation of their rights as “the devils in human form.” Here the press is the major instrument to declare who is enemy and who is not.3 After that, it mobilises the masses against the opposition. The government has escalated the repression against the opposition after declaring state of emergency by the effective usage of the politicization and depoliticization processes. Also the bourgeoisie has designed its press once more after the accomplishment of the five critical domestic security issues mentioned above. Hereafter the expectation from the press is to formulate every act of the government as “national will” and to mask the class character of the state. Önder Kulak holds a Ph.D. in philosophy; studying German Idealism, Marxism, and Frankfurt School; has books, book chapters, articles and translations in journals and internet portals. Kansu Yıldırım is an independent researcher based in Ankara and an editorial board member of Kampfplatz (Turkish journal of philosophy and social science), and a columnist for BirGün (Turkish left-wing daily newspaper). 1. Actually, Article 12 was planned to be put in to place nearly four years ago. However there were no really adequate technical conditions to realize that process, and then the regulations were postponed for a future time. 2. Louis Althusser, “Ideology and Ideological State Apparatuses,” trans. Ben Brewster, Marxists.org , 1971. 3. This situation is like the term mass mobilization against a political ideology belonging to Jacques Ellul in Propaganda: The Formation of Men’s Attitudes . It uses the term in the sense of the power which uses TV, radio and printed media to specify and begin a mobilization against its enemies. 4. This point should be thought of by the term transformismo associated with Antonio Gramsci and his idea of the formation of passive consent. Featured image is from the authors.